Our biology is no longer destiny. Our genes respond to everything we do, according to the revolutionary new science of epigenetics. In other words, our inherited DNA doesn�t rigidly determine our health and disease prospects as the previous generation of geneticists believed. Especially in the last ten years, scientists have confirmed that the vast majority of our genes are actually fluid and dynamic. An endless supply of new studies prove that our health is an expression of how we live our lives�that what we eat and think and how we handle daily stress, plus the toxicity of our immediate environment�creates an internal biochemistry that can actually turn genes on or off. Managing these biochemical effects on our genome is the new key to radiant wellness and healthy longevity. Now gaining broad credibility among scientists, the study of epigenetics is at the forefront of modern medicine. According to the author, the real upshot of the epigenetic revolution is that it opens the door to what futurists call personalized medicine. For the first time in a trade book, Dr. Pelletier explains in layperson�s language the genetic biomarkers that will become the standard reference for measuring which specific lifestyle changes are required to optimize a given individual�s health. In the very near future, each person�s state-of-the-art genetic and epigenetic profile�matched with other precise indicators such as assays of the gut microbiome�will guide their daily health practices. 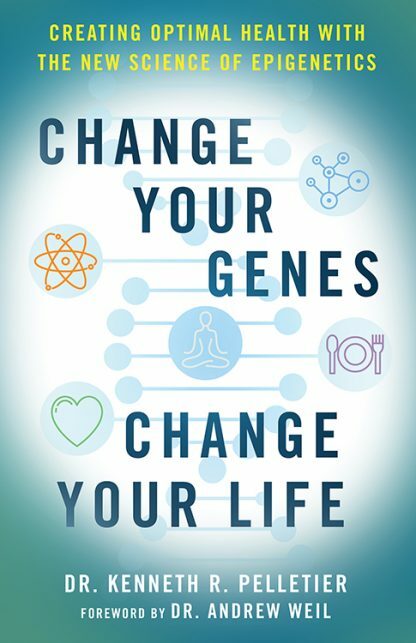 This short but profound book by a world-renowned pioneer in integrative medicine introduces readers to this exciting new field, and reveals the steps that each of us can take today to change our genetic expression and thereby optimize our health for a lifetime. Kenneth R. Pelletier, PhD, MD is a clinical professor of medicine and psychiatry at the University of California School of Medicine in San Francisco. He is a medical consultant to the US Department of Health and Human Services, the World Health Organization, the Federation of State Medical Boards, and major corporations. Kenneth also serves as chairman of the American Health Association and is a founding board member of the American Board of Integrative Medicine. His research, clinical practice, and publications have been the subject of numerous national television programs including appearances on the ABC World News, the Today show, Good Morning America, the CBS Evening News, the MacNeil-Lehrer NewsHour, CNN, numerous PBS specials on his books, and the award-winning BBC series The Long Search. Kenneth is the author of ten books including the international bestseller Mind as Healer, Mind as Slayer and has published over 300 medical and professional journal articles.